England - the future.... - Page 51 - Hob Nob Anyone? Old Man Andrews Really can't see how you can leave Lallana out. Has played a total of 16 minutes since March. Despite not winning any of the following.....1980, 1982, 1986, 1988, 1990, 1992, 1996, 1998, 2000, 2002, 2004, 2006, 2010, 2012, 2014, 2016....and having no great confidence in the squad I think we've got this one!! What is going on? Phil Jones is not gurning in that photo. Plus a reserve team game where he tried to strangle a kid to death. Ah yeah, who could forget! Sanguine As above, pretty happy with the squad. Are we not heavy on defenders though? You've got Maguire, Stones, Jones and Cahill as centre-backs, and Walker who can play there. Then you have Walker, Trippier and Alexander-Arnold who can play right-back, and Rose, Young and Delph. Surely we could have lost a wing-back (Delph) for another midfielder? He's playing 3 centre backs though, so that's 5 centre backs for 3 places (Walker starting the tournament at centre half IMO), and two wing backs for either side (Alexander-Arnold and Trippier on the right, Rose and Young on the left). It's fine having players able to cover multiple positions but at the same time, if there are a couple of injuries, they can only play in one position at a time so you need proper cover. 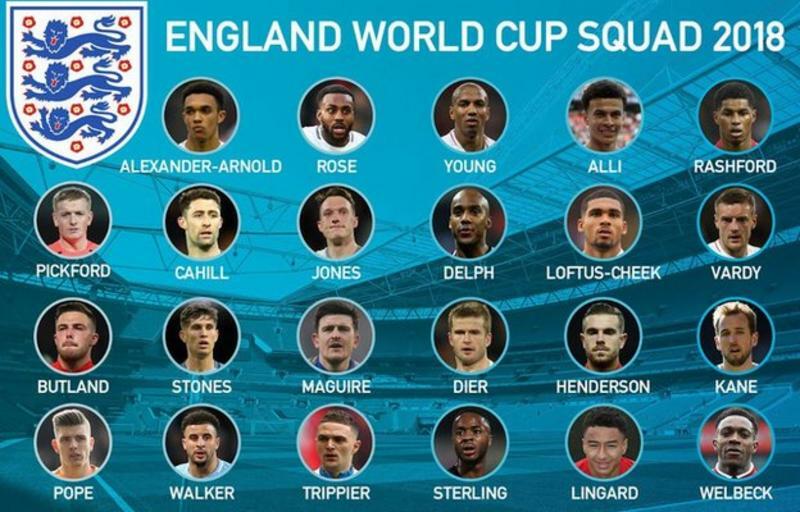 I'd love to have seen Wilshire, Lallana, Barkley or Oxlade-Chamberlain (even Winks) in place of Delph, but Southgate's hands are tied on that front and Delph offers the mobility and all round game to play in a midfield 3 along side Henderson in the way Milner and Wijnaldum do for Liverpool. A decent squad, but still lacking a bit of flair and x-factor, and it's untested and unproven at the back which is a bit of a concern. Interesting, although probably irrelevant, the FA squad does list Delph as a defender. Just me that thinks this is bizarre? 6 full backs and no creative midfielder. Please tell me it’s a joke. Wilshere may not quite be the player I want him to be but he has proved his fitness, and has had a decent enough season. And then there’s Shelvey who has been in blinding form. It’s not 6 fullbacks though is it? It might be 6 players who could or have played at fullback at one time or another, but that’s a ridiculous line to take. As for Wilshire, as much as I’d love for him to be in the side, Southgate has chosen a way he wants us to play and Wilshire (as reported in The Times this week) wasn’t up to it because of his fitness levels and that’s why he went back to Arsenal before the Netherlands friendly. Not an injury, just not fit enough to press and attacking in the way Southgate wants his midfield to. For years people, probably you included RR, have been demanding England managers pick a team as opposed to a collection of names and reputations. It seems Southgate has done that here, for tactical reasons, and I think he should be applauded for that. I do not believe that either Young or Delph would have been selected for their potential contribution to the midfield alone. So I have to think they are in the squad because they have played regularly at full back. Selecting players because of their dual purpose abilities is folly. You need out and out talent selected to play in their specialist positions. Royal Rother I do not believe that either Young or Delph would have been selected for their potential contribution to the midfield alone. Young is presumably there as one of the two left wing backs, and probably rightly so on this seasons form. Delph is there as a midfielder, and selected over Livermore as one of those energetic midfielders who can play as one of a three (ala Liverpool and where he played quite well for England under Hodgson) or as a tenacious holding player as he has done for City. There aren’t too many alternatives for position who are fit and available. Looking at the numbers, Walker is there to play centre half and so Southgate has taken two other right wing backs because, as you say, you need depth in each position not just multipurpose players. Walker is there to play centre half? You keep more current than I do I suspect but that would really surprise me. Royal Rother Walker is there to play centre half? Having Walker there with his pace adds an extra ability to recover (handy when Stones starts dicking about) as well as someone comfortable on the ball. It also means he can squeeze in another attacking threat as Walker can can still bomb forward and add width which I’m guessing Southgate wants against those sides who’ll sit in against us. Hoop Blah and it's untested and unproven at the back which is a bit of a concern. Made this point earlier, but it's a defence that has conceded just once from open play in eight games, including clean sheets against Germany and Brazil, and just that penalty against Italy. I'm surprised he has never played in a World Cup tbf. I did see that. I'd argue it's only 4 friendlies since Southgate switched to the 3 at the back, based on Stones and Maguire, and even though they were against good opposition in Brazil, Germany, Italy and, less so, Netherlands it's not quite the same as competitive football. In those 4 games he started Stones, Maguire, Gomez, Jones, Tarkowski, and Walker as the centre halfs and two of those aren't in the squad so I wouldn't say that their settled into a unit yet, let alone test or proven.